The third and final 2016 presidential debate is in the books! Donald Trump and Hillary Clinton battled it out in Las Vegas on Wednesday, October 19, with the talk turning to "bad hombres," Celebrity Apprentice and, of course, the women who have accused the real estate mogul of sexual misconduct. Click here for our picks for the five craziest moments! Here is Us Weekly&apos;s by-the-minute roundup of everything that happened during the tense event, moderated by Chris Wallace. Be sure to start reading at the bottom if you want to get it in chronological order. 10:48 p.m. ET: Neither Clinton nor Trump prepared closing statements tonight, which meant that when Wallace asked for a minute&apos;s worth of wrap-up from each candidate, the result was about as expected. Hillary Clinton&apos;s remarks covered well-worn territory from her "Stronger Together"–themed campaign, as she extolled the "good" of America and spoke not just to Democrats, but the country at large: "We need everybody to help make our country what it should be." And Trump&apos;s closing was equally as familiar: "We&apos;re going to make America great," he said, citing his commitment to military strength and respect for the police and "law and order." But his last sentence, like most of his contributions tonight, was a jab at his opponent — who he says will usher in "four more years of Barack Obama" if elected. 10:44 p.m. ET: Before closing statements, Wallace put forth a question about the national debt. How does each candidate intend to deal with it — especially when neither of them has a plan to address the impending implosion of Medicare and social security? This was initially a question for Trump: Would he accept a plan for reducing entitlements that included a tax increase? It would have been interesting to hear Trump&apos;s answer to this question, but he didn&apos;t really give one. Instead he pivoted directly to a talking point he hadn&apos;t hit yet: "Repeal and replace Obamacare." Clinton fielded the same question, which she also didn&apos;t really answer; instead, she said she hopes to stave off the necessity for that sort of deal through her plan to raise taxes on the wealthiest Americans. Clinton pointed out that her taxes would go up, as would Trump&apos;s — "unless he can figure out a way to get out of it," she quipped. Trump couldn&apos;t resist responding to that: "Such a nasty woman." 10:30 p.m. ET: Trump had been dying all night to talk about ISIS, and it was the second-to-last topic of the evening. This segment was mostly a retread of familiar territory to begin with: Clinton went in-depth on her foreign policy plans; Trump explained that he doesn&apos;t want to share his plan to defeat ISIS because he wants it to be a surprise; and Clinton pointed out once again that Trump not only supported the war in Iraq, but that there&apos;s verified audio of him saying as much. "Why does that matter?" Clinton asked. "Because he has not told the truth about that position." It looked like she was going for a hard hit here, but it didn&apos;t carry the weight she was hoping it would. It did, however, unsettle Trump enough that the next minute or so devolved into an unintelligible mess of cross talk. When things calmed down, Trump pointed out Clinton that Bernie Sanders once said she had bad judgment; Clinton replied by pointing out that Sanders is now campaigning for her, and that despite what he may have said about her, he also recently called Trump "the most dangerous" presidential candidate in the history of ever. 10:21 p.m. ET: Because Donald Trump has spent so much time in advance of this debate claiming that the election is "rigged," Wallace made time explicitly to ask the GOP candidate if he will be gracious about the results of the election, should he lose. Trump&apos;s response was to accuse Hillary Clinton of being crooked — so crooked, in fact, that she should never have been permitted to run at all. "Should&apos;ve gotten it," he quipped, with a grin, about his NBC reality series. 10:17 p.m. ET: Both candidates&apos; charitable foundations were under scrutiny as Wallace pivoted to a question about the Clinton Foundation — and whether Clinton has kept her pledge to avoid conflict of interest. When Clinton began to discuss the foundation&apos;s work with people with HIV, of which she said she&apos;s proud, Trump leaped in to accuse Clinton of misusing money, calling the Clinton Foundation a criminal enterprise. Clinton&apos;s response, a hit back at the Trump Foundation, was a rare moment in which she showed some snark: Clinton described how the foundation "took money from other people and bought a six-foot portrait of Donald. Who does that?!" Clinton then returned to familiar territory, pointing out that Trump&apos;s answers are impossible to fact-check for truthfulness because he hasn&apos;t released his tax returns. But Trump&apos;s response in this case was something we haven&apos;t heard before: He claimed that if Clinton had a problem with the way he worked the system in his favor, she should have used her position as a senator to stop him. "If you didn&apos;t like what I did, you should have changed the law!" he said. Since Trump didn&apos;t directly address the content of what he&apos;s been accused of, Clinton responded with a quick summation of how he&apos;s responded in other forums over the past week — including his claim that he would never have groped or kissed the women in question because they&apos;re not attractive enough. "I did not say that," Trump interrupted. "I did not say that." Clinton, rather than arguing that point, made a broader one: "Donald thinks that belittling women makes him bigger. He goes after their dignity, their self-worth. And I don&apos;t think there&apos;s a woman anywhere who doesn&apos;t know what that feels like." Trump claimed everything Clinton said was "fictionalized," or maybe even invented by Clinton herself. And anyway, he didn&apos;t want to talk about this because what&apos;s important — and we bet you can guess what&apos;s coming next — is Clinton&apos;s emails. 9:57 p.m. ET: Clinton has been more easily ruffled tonight than in previous debates, but this moment might end up being a turning point. After Donald Trump insisted that Hillary Clinton has experience, but it&apos;s "bad experience," Clinton landed a rare punch with her rebuttal, which compared her experience at any given moment in history to Donald Trump&apos;s.
The clincher: "On the day when I was in the Situation Room, overseeing the raid that brought Osama bin Laden to justice, he was hosting the Celebrity Apprentice." 9:54 p.m. ET: New topic time! We&apos;re on to the economy. Wallace pointed out that there&apos;s more government involvement in Clinton&apos;s plan, whereas Trump&apos;s plan is to deregulate. Wallace asked each candidate to explain why their plan will create more growth. "I think that when the middle class thrives, America thrives," Clinton replied. Her answer hit on a lot of points: a jobs program, investment in infrastructure and advance manufacturing. She mentioned clean energy — there was a quick name-drop here for climate change — and then fit in two more rapid-fire talking points to touch on equal pay for equal work and raising the minimum wage. She also said she has a free-tuition plan that was worked on by Bernie Sanders, who she called out by name — probably in the hopes that any holdout young Bernie-or-bust voters will be swayed to her side. And why is Trump&apos;s plan better, Wallace asked? Per usual, Trump&apos;s response was less a specific policy outline and more about dissing Hillary Clinton: "Her plan is a disaster," he said. But eventually he meandered back to discuss stimulating the economy: "We&apos;re gonna make a great trade deal," he said, and "we&apos;re going to cut taxes massively." "Let me translate that if I can, Chris," said Clinton. Trump leaped in: "You can&apos;t."
Clinton did have a substantive response, though: She promised no tax increase for anyone making less than $250,000 annually, no deficit increase, and a path to eliminate the national debt. 9:41 p.m. ET: The next question was immigration, although it didn&apos;t take long for both candidates to veer wildly off topic. To begin with, Clinton brought up Donald Trump&apos;s visit to Mexico, which was either a disastrous embarrassment or a wild success, depending on which candidate you listen to. She also made it personal: She wants to protect immigrants from advantage-taking employers — like Donald Trump, she said, citing his treatment of immigrant workers. In response, Trump accused Clinton of wanting wide-open borders, and Wallace cited a quote from Clinton&apos;s leaked speeches that he asked her to respond to: "My dream is a hemispheric common market with open trade and open borders." Clinton said that this quote is specifically about energy, but that more important, she wanted to remind us all that Wallace is quoting from WikiLeaks, which is widely believed to be acting on behalf of the Russian government in an attempt to influence the outcome of the U.S. election. Trump responded by calling this "a great pivot" to distract from her desire for open borders, which got a laugh from the crowd. But then he pivoted himself to hit on his now-familiar talking point about the threat of Islamic terrorism. There was some cross talk, and then both candidates were suddenly discussing Vladimir Putin. "He wants a puppet for president," said Clinton of Putin (an obvious dig at Trump). "No, you&apos;re the puppet," Trump snapped. Wallace asked if the real estate mogul condemns interference by Russia in the American election. "By Russia or anyone else," Trump said. But he went on to claim that Putin "has outsmarted [Clinton] and Obama at every step of the way." 9:31 p.m. ET: The Supreme Court remained the topic of discussion, which meant a discussion of both gun control and abortion. First, Hillary Clinton said explicitly that she supports the right to bear arms: "That is not in conflict with sensible, common-sense regulation," she said. Citing the enormous number of lives lost to gun accidents every year, she said her aim in enacting gun control measures is to prevent some of these tragic deaths. Donald Trump said that he&apos;s proud of his NRA endorsement and that he intends to appoint justices who will keep gun rights as robust as possible. Clinton responded by talking not about the future of Roe, but about the current state of abortion rights in the United States. "It&apos;s not only about Roe v. Wade. It&apos;s about what&apos;s happening right now in America," she said, pointing to the restrictions being placed on abortion in places like Texas — which make getting an abortion difficult. 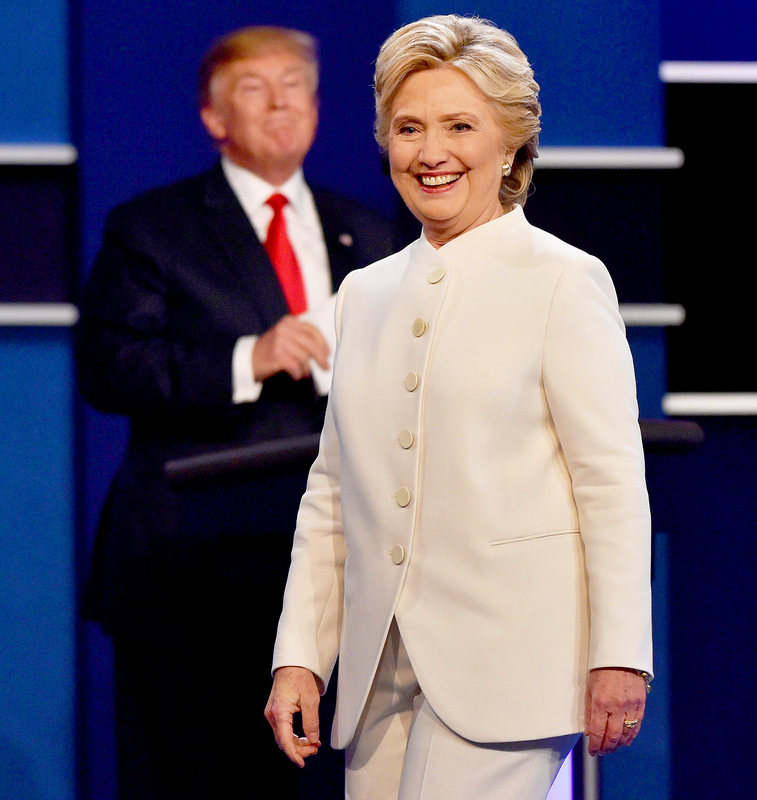 Clinton also reminded viewers that in the event that abortion becomes illegal, Donald Trump advocated for legally punishing women who terminate their pregnancies — which Wallace promised to address, but they never actually returned to it. The conversation then veered to the issue of partial-birth abortion, which provoked some colorful commentary from Trump: He described his opposition to abortions that take the form of "ripping the baby out of the womb in the ninth month" (or even "on the final day") of a pregnancy. This is not an accurate description of any sort of legal abortion, but let the record show that he&apos;s not OK with it. Clinton came back with her fiercest and most unequivocal statement yet: "The government has no business in the decisions women make with their families, in accordance with their faith, with medical advice." 9:10 p.m. ET: First up, said Wallace, let&apos;s talk about the Supreme Court — and the U.S. Constitution. Is it a living document, or should we hew closely to the original? Hillary Clinton&apos;s response didn&apos;t directly address the question of originalism, but she talked a lot about the Supreme Court, which she said should represent the will of the American people. That means no reversal on marriage equality, and no overturning of Roe v. Wade, among other things. Donald Trump started, unsurprisingly, by making a dig Ruth Bader Ginsburg, who he&apos;s still peeved at for having made what he called "inappropriate" comments about him. Having done that, he promises to appoint pro-life justices and to stick to a more originalist interpretation of the Constitution. 9:07 p.m. ET: And we&apos;re off! Moderator Chris Wallace opened with the usual admonishments to the audience not to make noise during the debate, rude or otherwise. However, he also mentioned that nobody has received any question in advance — possibly a preemptive response to Donald Trump&apos;s repeated complaints that the debates (and the election process in general) is "rigged." 8 p.m. 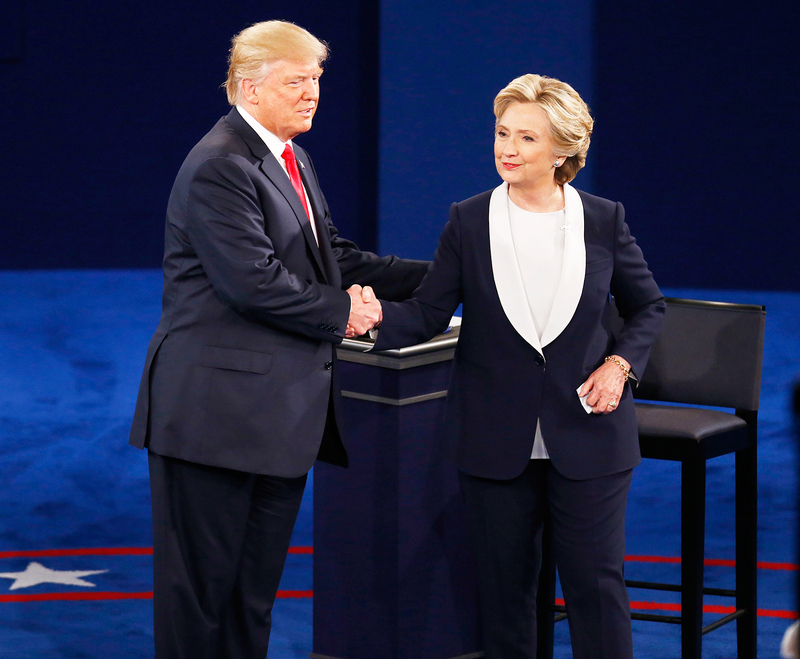 ET: If you thought the first two 2016 presidential debates between Donald Trump and Hillary Clinton were intense, get ready for round 3, which is likely to be a gloves-off affair! The third and final presidential debate takes place on Wednesday, October 19, at the University of Nevada, Las Vegas, and arrives just three weeks before America selects its commander in chief on November 8. The debate starts at 9 p.m. ET and is scheduled to run commercial-free for 90 minutes. You can watch it via the livestream at the top of this post, and it also airs on all major TV networks. Unlike the second debate that was held in a town hall forum and centered on the concerns of undecided voters, moderator Chris Wallace is tasked with selecting the questions this time around. Six areas of discussion will be addressed: entitlements and debt, immigration, the Supreme Court, the economy, foreign policy and the fitness of each candidate for the nation&apos;s highest office. Based on their tactics in the first two debates, we know roughly what to expect from both candidates when they take the stage for their final face-off. Trump will bring up the ongoing issue of Clinton&apos;s private email server, possibly threaten to have her thrown in jail if he becomes president and almost definitely end up with a moment or several that will quickly go viral on social media (much like his lurking during the second debate). Be sure to refresh this post throughout the event for by-the-minute updates. The third presidential debate airs live on all major networks on Wednesday, October 19, at 9 p.m. ET.